His endeavors lead to a comedy of errors, charades, and knotty love affairs. Yet he forges ahead in spite of pesky house guests, a flea bitten mattress, his lovesick best friend, and a blackmailer. His simple plan for winning the wager suddenly becomes… a tad complicated. THE WICKED WAGER was a wonderful story. I was instantly hooked on both the plot and the great characters (seriously, I love these peeps). Not to mention the writing! I'm definitely looking forward to new books by this author. I really, really liked this book. It was a relatively quick read, although the pacing did bother me a little after Raikes entered the story. It wasn't that bad, but had the writing not been as good I probably would have skimmed some parts. Pacing issues aside, I have been recommending this book left and right to everyone I spend more than 5 minutes around. It had me chuckling many times, and I'll admit to totally forgetting to cook dinner one night. By the time I sat the book down and looked at the clock, it was too late for anything but pizza delivery. That's saying something, because in well over 30 years, less than a dozen books have ever distracted me to that extent. 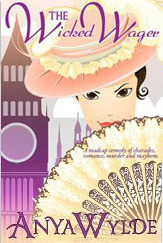 I had so much fun reading THE WICKED WAGER and I highly recommend it to fans of mysteries and historical fiction. While I was reading this book, I kept thinking what an awesome movie it would make as well! I like this cover. I'm a big fan of the more artistic covers and the coloring and font is nice. I wholeheartedly approve. - When Raikes' pants split down the seam… So funny.